Linking up with Erika and Narci for Friday Favorites - my list is EXTRA miscellaneous today. Brace yourself. First up on my list of FAVORITES this week is naps. Griffin was fighting a cold earlier this week and naps were on the top of her list. .. and snuggles with Mommy (even when I was working on grading). She started feeling better Monday night and seeing the sparkle back in her eyes was my FAVORITE! Having a stuffy baby in my bed at all hours of the night (and morning) meant that my comfiest clothes were called for this week. Matilda Jane ruffles and THIS TEE fit the bill. It's been chilly out, so I paired THESE CLOGS with sweater tights on another day. Swoon. And this sweater with fun shoulder detail was on the agenda as well. The "this day in years past" function of Facebook KILLS me and when this picture of Mason from four years ago popped up on my newsfeed we had to recreate it. That big smile is my FAVORITE! Sweet happy morning pictures are my FAVORITE! ... and look at all those awards! Getting to be a part of such an AMAZING place is my FAVORITE!!! So blessed to be an MCA parent and faculty member. Bubble baths are this girls FAVORITE! I tried these out this week and they're a new FAVORITE. So so so good! And we ran into our of our very FAVORITE people earlier this week... Mr.Ron!!! My FAVORITE part of superbowl weekend? Hands down the queso. If you're looking for a great recipe, give this one a try. It's my go-to. Another great part of the weekend is that one of my FAVORITE brands is running a HUGE sale on their Holiday and Final Sale collections. Use the code SUPERBOWL2016 and get 30% off! 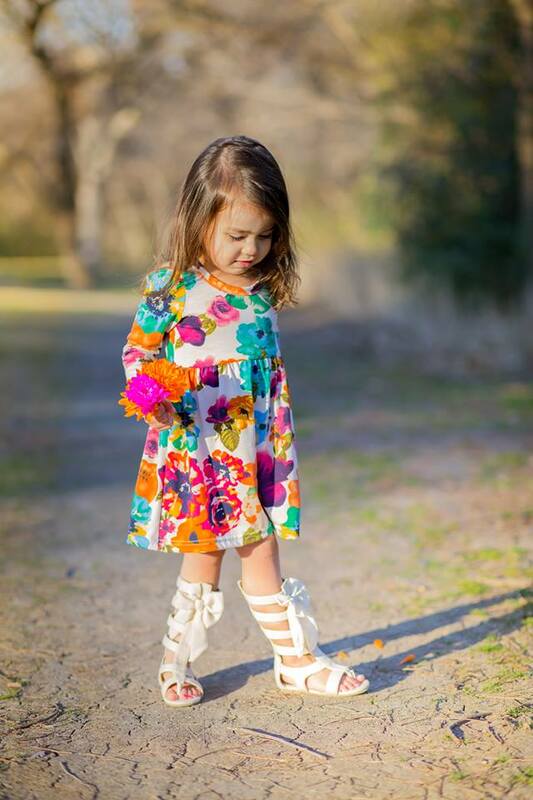 This tunic and leggings from Sew Chill came this week and I am DYING over how precious she looks! Taking her baby for walks is her FAVORITE..
Head on over to my Instagram today for details on how to win one of these adorable fox tunics! And today only you get get 15% off the entire Sew Chill collection with the code griffin15 (code will expire at 11:59 pm EST tonight!). I'm pre-ordering the dress below for Griffin because how GORGEOUS are those flowers?!?! HUGE shoutout to Sew Chill for sending Griffin the tunic and leggings and for providing the tunic for the winner!!! Hoping you have a WONDERFUL Friday, friends! PS - This post contains affiliate links, which just means that if you click on a link and purchase an item I may receive a small commission. Thank you!!! I thought for sure you would say something about Gilmore Girls officially coming back to Netflix!! :) #LukeAndLorelaiForever. Have a great weekend! AAAHHHH!!!! I should have! I'm so excited, but if Luke and Lorelai aren't together in the new episodes I'm not sure I'll be able to watch!!! Thanks, girly :) Loved seeing your 100 year old Smith! Mr. Ron!!!!! And super sweet pic of g in the tub! Gotta love a good bubble bath! Right?!?! We love us some Mr.Ron!!! That's the thing about personal style - it's personal. I buy and wear things that I love and things that I feel good wearing. While I do take into consideration what Dave likes (and, believe it or not, Dave likes what I wear), the last time I cared what random strangers thought about how I looked was middle school. Oh Andrea. I don't understand all the rude comments you get. For the record, I LOVE that you wear what you love. 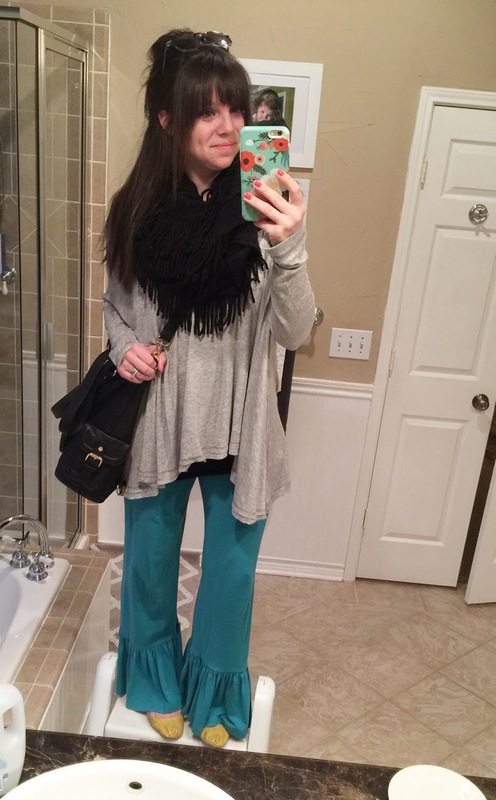 You inspired me to branch out and I ended up with some pants I never would have tried on but ended up loving and getting so many compliments! Keep doing you, because you are awesome! Dear Anonymous #1, I actually feel sorry for people like you. You feel shaming others is acceptable behavior and somehow validates or elevates you. You have a lot to learn. This is the year 2016. This world is big enough for all of us to be our individual selves and live in it without feeling the need to tear others down; it's the trademark of a confident,progressive mind and heart. Andrea, I admire the ways in which you have 'arrived' - you show complete confidence in who you are, you are comfortable in your own skin and don't let the pressure to conform to a standard of mediocrity influence your behavior or preferences. The influence this has on your children and middle school students could not be more significant to their well being in an often cruel world. They are developing, by your example, the confidence it takes to being unafraid to be true to their unique individualism and learning to respect that in others as well - how refreshing. I would love for my tween to have a teacher like you speak that truth into their lives on a daily basis. Great responses, ladies. And I am laughing so hard at Anonymous #2's hashtag. Save Dave! Hahahaha. Love you, Andrea. You're adorable- you AND your clothes! Sure! Which pair? My shoes are linked above, Griffin's black puppy shoes are Mini Melissa and you can find them on Amazon and Nordstrom and I'm pretty sure that the gladiators that Genevieve is wearing in the Sew Chill photo are by Joyfolie. Love your blog and your sweet family! Reading each morning is always something to look forward to! Love Evystree too! Thanks, Jodi!!! Isn't Evys Tree the best??? Awwww, y'alls uniforms at MCA are the same exact ones that I used to wear when I was little. That picture just took me back! Aww! We are all sick over here too! I am jealous of your warm temperatures! Up here it is ski coats, hats, sweaters, and warm boots! Have an amazing weekend! I must say you are the sweetest mama! Love all the cute pics. Loving the purple/plum lace extender!! Where did you get it! I'm in desperate need of fun colors!! !